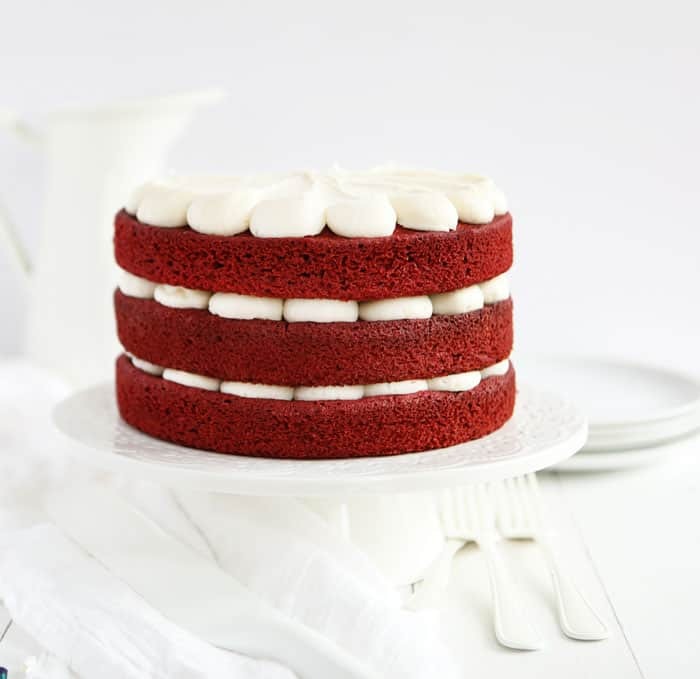 This red velvet cake is moist and flavorful and always a show stopper! 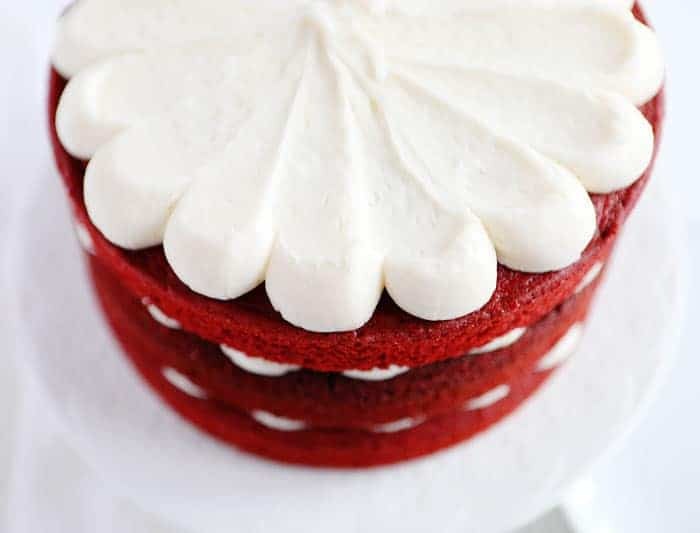 If you have never made a red velvet cake from scratch, now is the time! I love this cake for a number of reasons, but mostly because of the taste. It’s just darn delicious! 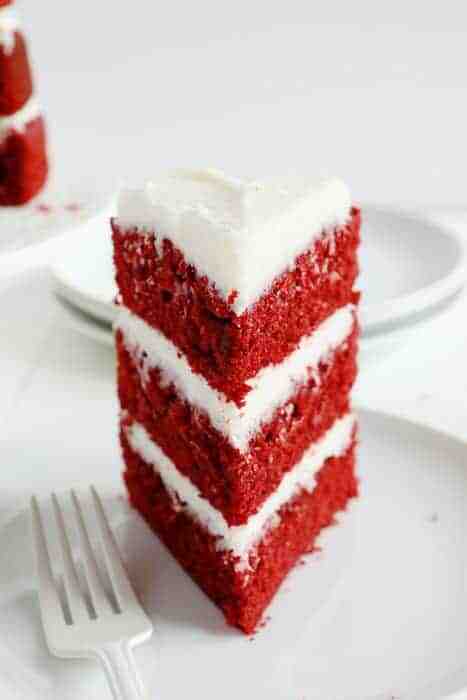 A really good Red Velvet Cake. 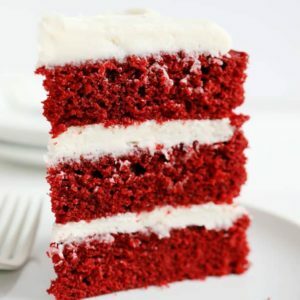 What is Red Velvet Cake? This cake has been around forever and started out with simple ingredients like cocoa, buttermilk, and vinegar.The redd color was added later, resulting in the vibrant colors we see today. It is traditionally paired with cream cheese frosting, but red velvet cake purists often prefer an ermine (what I call cake gravy) frosting. 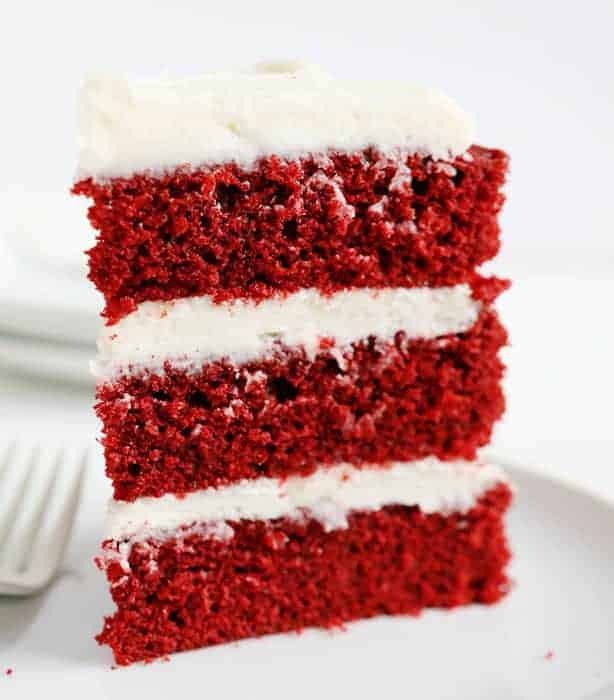 What Does Red Velvet Cake Taste Like? These days (in most recipes) it tastes like a chocolate cake. But it shouldn’t taste AS rich as a traditional chocolate cake because of the addition of buttermilk and vinegar, which cut into the richness of the cocoa. However, all of that depends on the quality and selection of the ingredients. You could use a special dark cocoa or apple cider vinegar or extra rich vanilla which would all impact the flavor. I walked the middle road with my red velvet cake recipe, using buttermilk and vinegar, but also food color. 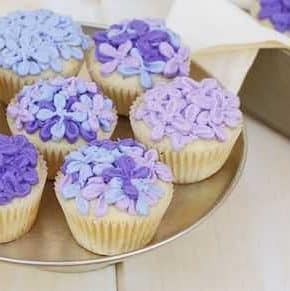 I also paired it with my favorite cream cheese frosting and think it’s all quite magical! 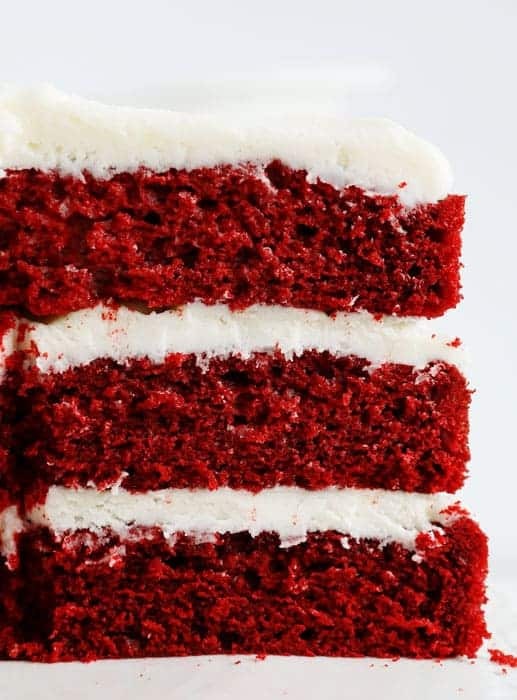 How do You Decorate a Red Velvet Cake? I decorated this cake with a few simple tools. First was a piping bag fitted with a 2A (large open round) tip. 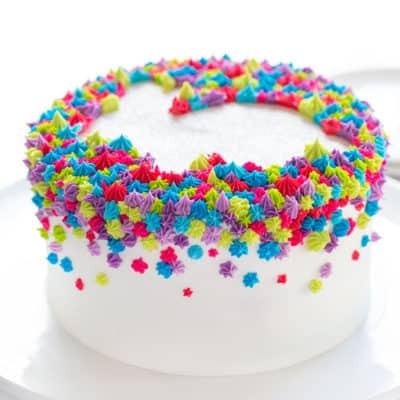 I used this tip to create the dollops around the edged of the cake. 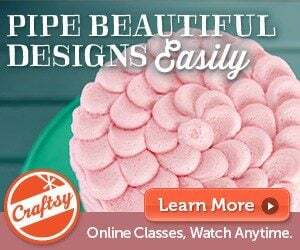 It is not essential to use a 2A tip, you can achieve a similar effect by just cutting off the tip of the piping bag. 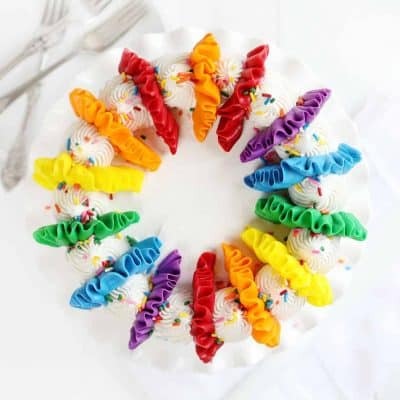 It IS important to use a piping bag to control the flow of frosting when piping the dollops. Next is the large offset spatula. This was used to create the pattern on top of the cake where I simply pressed the tip of the spatula down into the dollop and dragged towards the center of the cake. It’s so simple and forgiving yet a really beautiful way to decorate. 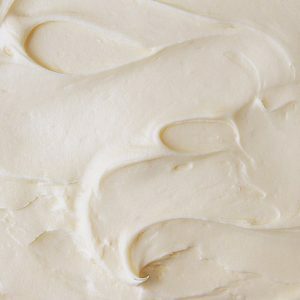 You can make your cream cheese frosting in advance, just make sure it comes to room temperature before you spread it on the cake. 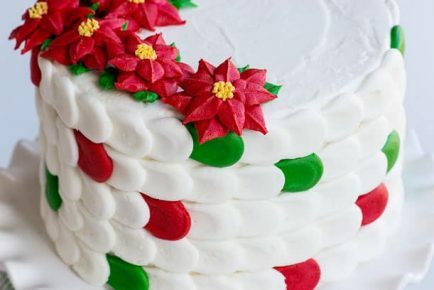 When cutting this cake use a long sharp knife. I like to cut cake chilled for more precise pieces, but for this cake specifically, I prefer to serve it at room temperature. At room temperature it is soft and using a sharp knife will help ensure your pieces stay together and look beautiful. Want to turn this recipe into brownies? Add an additional egg (so 3 total) and remove the baking powder. It’s dense and fudgy red velvet brownie fabulousness! Heat oven to 350°F. Prepare three 8-inch round baking pans by spraying with baking and lining with parchment or spreading GOOP and lining with parchment. In a 2 cup measuring cup (or medium bowl) pour buttermilk. 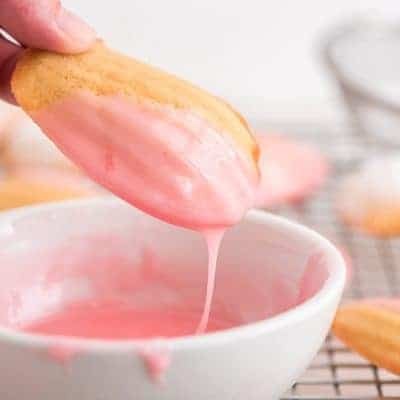 Add the vanilla, vinegar, and red food color to buttermilk and whisk to fully combine. Set aside. 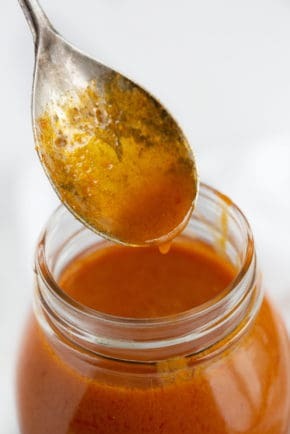 In a large bowl add sugar, oil, and eggs and whisk together by hand until it is smooth and light yellow. 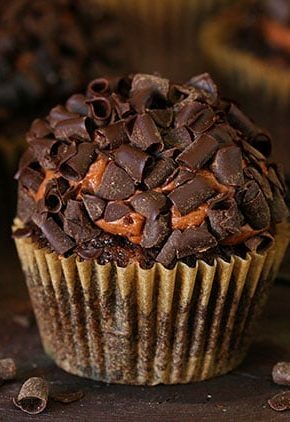 Add cake flour, cocoa, and baking powder to the sugar mixture and whisk until just combined. Now add the buttermilk mixture and whisk until just combined. You do not want any lumps, but I do recommend being gentle with this batter. Pour about 1 3/4 cup batter into each pan and bake for 22-32 minutes. When using my convection oven I will bake these at 325°F for 22 minutes. 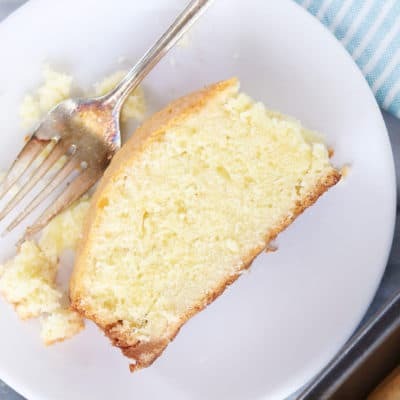 The cake is done when it does not appear wet on the top and if you press your finger gently in the center of the cake it feels firm. Allow to cool in the pan for about 5 minutes, then invert onto a cooling rack. Chill cakes until ready to assemble. 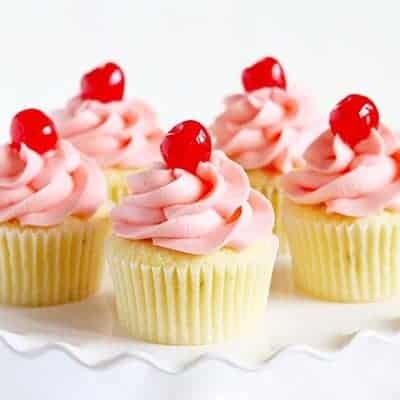 Combine all ingredients except the sugar into the bowl of stand mixer and mix on medium speed until smooth, about 3 to 4 minutes. Reduce the mixer speed to medium low and add the confectioner’s sugar one cup at a time. Scrape down the sides of the bowl often. Once all sugar is added, beat until fluffy, 3 to 6 minutes. After additional testing, this recipe has been updated to use CAKE FLOUR instead of all-purpose. 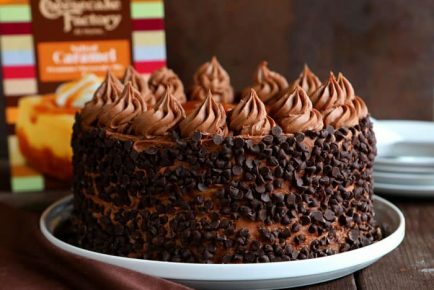 Use the tag #YouAreBaker when posting a photo of your recipe, and make sure to follow @IAmBaker on Instagram! Check Out These Awesome Posts! 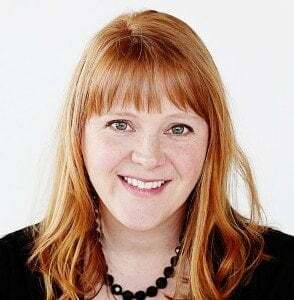 Amanda Rettke is the creator of I Am Baker, and the bestselling author of Surprise Inside Cakes: Amazing Cakes for Every Occasion – With a Little Something Extra Inside.Over the course of her 15+ year blogging adventure, she has been featured in and collaborated with the Food Network, New York Times, LA Times, Country Living Magazine, People Magazine, Epicurious, Brides, Romantic Homes, life:beautiful, Publishers Weekly, The Daily Mail, Star Tribune, The Globe and Mail, DailyCandy, YumSugar, The Knot, The Kitchn, and Parade, to name a few. For food coloring, could gel be used? are you sure you didn’t mean baking soda not baking powder. My cakes came oout flat as pancakes. 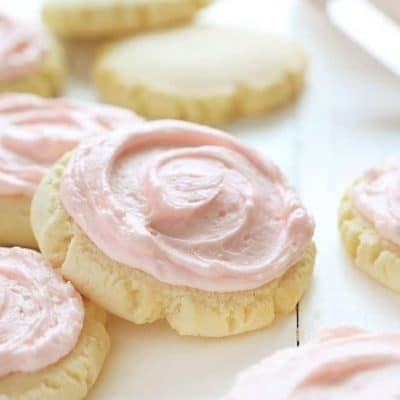 Other recipes I saw used baking soda. How can I replace cakeflour with All purpose flour; as everytime cake flour is not available? Amanda i dont have cake flour could u guide me how much all purpose flour ill take to amke a lovely cake like yours. 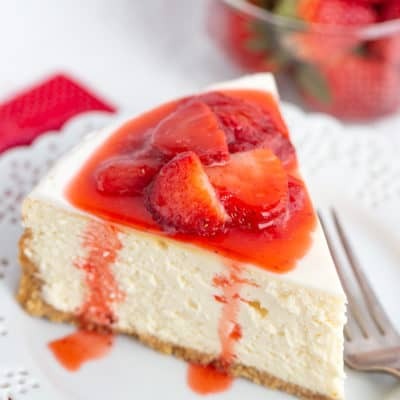 Hi Amanda…I love I AM BAKER & try many of your fabulous recipes!!! You mentioned making red velvet brownies (vs. cake) by slightly adapting the ingredients. What size pan & how long do you cook them? Yes, this is a great red velvet cake!! 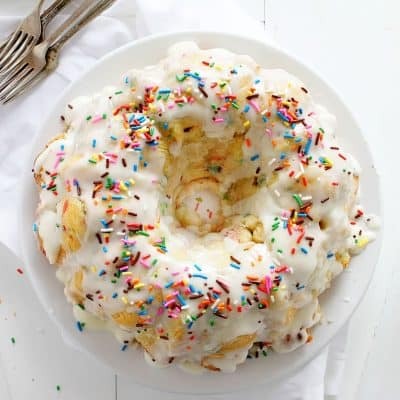 I like to make a frosting like your ding dong cake filling for a lighter taste that allows the delicate flavor of the cake to be appreciated. I love you!!! Thank you for sharing… I’m Pesamie from Philippines…. 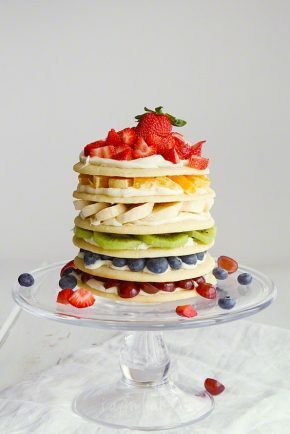 i am baker is a national baking and lifestyle website devoted to inspiring women to embrace their inner-baker. Through easy to-understand tutorials, award-winning photography, and an open, raw and inviting writing style, Amanda will show you how to make her drool-worthy Rose Cake and hopefully make you laugh. Put Something Special Into Your Baking! Subscribe to my weekly newsletter to receive the latest recipes, news, and more!